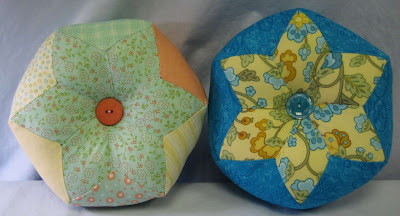 Hooked on Needles: Giant Pin Cushions ~ fun, cute and pretty easy too! 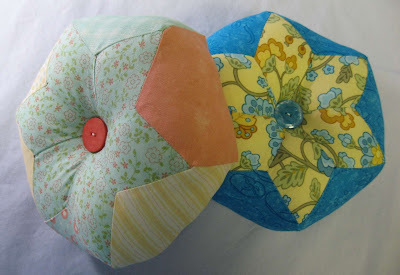 Giant Pin Cushions ~ fun, cute and pretty easy too! 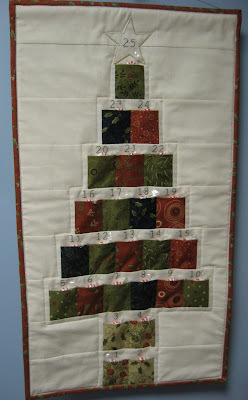 I've been having such fun the past couple days trying out a sew-along pattern from Vickie over at Spun Sugar Quilts. It's for Giant Pin Cushions, and I mean GIANT! They are a full seven inches across and three inches thick! They are what you might call Party Pin Cushions -- big enough for a whole group to use! I did them both using fabric from my stash. The one on the right is made from two fat quarters I had. I have enough of each leftover to make several more if I wanted to. They don't take much fabric at all! The one on the left is made from some of the leftovers of Celebrate Spring charms and a little yardage from when I made my Spring Table Runner. One of these will be a giveaway prize when I finally post my 600+ post celebration giveaway soon, along with another item I have made and another nice little prize for some lucky person, so stay tuned for more information on that. If you would like to make your own Giant Pin Cushion, hop over to Vickie's sidebar and check out her sew-along with all the appropriate links listed there. She has instructions for English Paper Piecing and for machine piecing which is what I used. These are quick and fun projects and a great way to use up little scraps or leftovers from your stash. 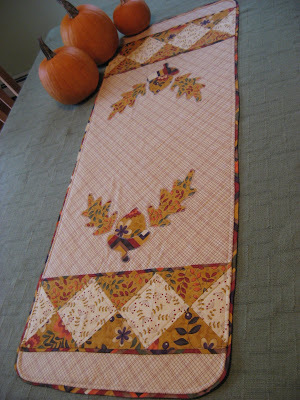 Plus they would make great gifts for your sewing circle friends or your favorite quilting buddy. I made an oversized pin cushion earlier in the year and I love it, I use it all the time. 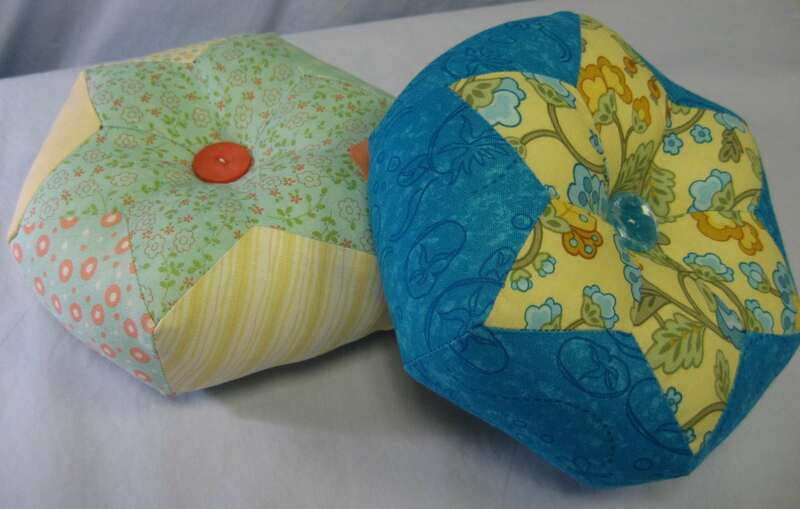 I really like this - a big pincushion is just what I need! You are keeping me busy with all your great ideas! !